Operators should be aware that people’s lives depend on the efficacy and reliability of their equipment. Like all safety equipment, height safety solutions should be checked regularly to ensure they are in 100% working order. This includes personal protection equipment and devices such as Lanyards & Rope, Harnesses & Belts, Fall Arrest Blocks and Anchorage & Connectors. Failing to maintain or store these items in the right conditions can result in catastrophic failures. At LHR Marine we offer a comprehensive inspection and recertification service for safety related products and Working at Height equipment. Our experienced and highly trained staff can also provide a wide range of advice which includes Consultancy & Installation Services, System Design, Certification, Re-Testing and Training. LHR Marine is proud of the fact that we are now a fully authorised service centre for a number of manufacturers including Capital Safety (DBI-SALA & Protecta), Billy Pugh Co. and SAFEGUARD® Technology. It is our promise to ensure that your products are returned to you operating as the manufacturer intended. Getting your equipment serviced by a fully authorised service agent is crucial, as equipment which is repaired or serviced by a non-approved company may not only be dangerous but also may no longer conform to the relevant standards. 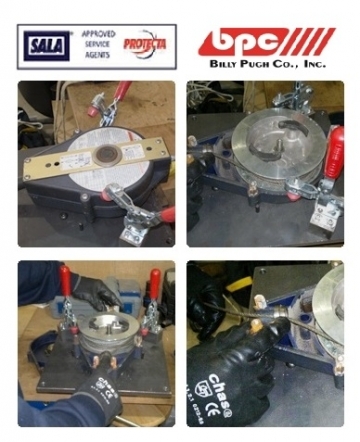 Equipment which is repaired or serviced by non-approved companies may have been fixed with non OEM parts. If you require us to get an item serviced of which we are not the authorised service centre for we can have this done on your behalf and you can be assured that we will only use the appropriate accredited service agent, in some cases this may be the manufacturers themselves. We will not compromise your safety, we value your custom but most importantly we value your lives. The photograph on the right side of the page was taken during a service of an ULTRA-LOK® Lightweight Self-Retracting Lifeline (SRL) at LHR Marine's Service Centre in Aberdeen.